At a customer event in its Fontanafredda, Italy, tower crane factory Terex revealed a new more compact luffer and a new flat-top, along with a redesigned cab, operator elevator system, and ‘plug and play’ anti-collision system from AMCS. The key customer demand Terex focussed on with the new luffer, the CTL 272-18, was out-of-service radius. A redesigned ballast system and machinery deck keep the counterjib to 5.9m, with all equipment—winches, the electrical panel—on a single deck, at the same level as the cab. The maximum jib length on the 270tm class crane has been increased by 10m, while keeping to a tight out-of-service radius, without needing a sail for weathervaning. A 1.25t hoist on the counterjib simplifies lifting parts and tools. The positioning of the winches, on the same level, makes it easier for the operator to view their operation from the cab. Terex’s attention to ease of maintenance is further demonstrated with the new cab. This features large, panoramic, windows that can be replaced from inside the cab. Working from customer feedback, the company designed the cab for operator comfort, with a fully adjustable comfort seat. The cabin’s joystick controls feature a short stroke length to reduce arm movements and operator fatigue. Standard heating and air conditioning keep the cabin at a convenient temperature. Both new cranes feature Terex’s standardised control system, making it easier for operators to switch between cranes. Terex worked closely with anti-collision systems manufacturer AMCS on the crane. The new optional anti-collision system is designed in line with the upcoming revision to tower crane standard EN 14439 and anti-collision system standard EN 17076, which defines the safety function of anti-collision systems. Rather than needing modification to the crane to fit new sensors, the anti-collision system can take information directly from the crane’s control system. This will ease installation of the system, making it easier for fleet owners to fit anti-collision systems when required. 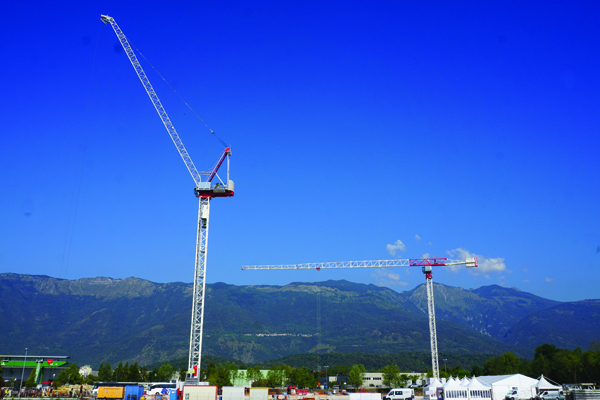 Another new rule impacting tower cranes is the upcoming French requirement for operator elevators on most tall tower cranes, which, after a one-year delay, is shortly coming into effect. Terex partnered with Italian materials and personnel hoist manufacturer Electroelsa to meet these requirements. A new external operator elevator was on show at the Fontanafredda event, and was kept in near constant use as customer queued to ride to the top of the luffer. This needs no changes to the tower crane mast. An internal elevator is currently under development. The new flattop city tower is the CTT 202. Terex is finalising the load chart for this crane, ahead of a Bauma launch, but this will be available in 8t and 10t versions. Both cranes can be fitted to three different Terex tower mast systems, making them suitable for customers around the world.